This is the first feature from Robert Kirkman’s Skybound entertainment. You may have heard of Kirkman before. He’s the creator of the comic book series that little AMC show is based on (along with writer and Executive Producer)…. The Walking Dead? I’m a big fan of TWD, so I made it a point to check out this film, happily in the comfort of my living room. Air is set in a post-apocalyptic world (seems as though there is no other kind these days) where engineers have the task of maintaining numerous underground, bare-bones facilities. These hold safe the future of humankind, constituted of scientists with varying specialties who remain in cryo sleep until the world is safe again and they can start over. The two-man team is awakened twice a year for a two hour period to perform routine maintenance checks and repairs to keep the place up and running. Problem is that one of the workers is a little cray cray and hallucinating just a tad. Of course, some other stuff happens and as I try to keep to a no spoiler post, I’m not going to say much more about the plot. The film is directed by the inexperienced Christian Cantamessa. Cantamessa, credited primarily for video games and shorts, seems out of his depth here. We’ve seen some really taut thrillers with a small cast in a tight and tenuous position… such as Gravity and Alien. Also, some not stellar but still fine … Solaris, Leviathan, and The Core followed a similar premise. It’s too bad that this one just sort of plods and dawdles along. While there is a dilemma to solve along with complicating factors, what was missing for me was that element of danger: that one extra that makes a bad situation oh so very much worse. Even when the twists do come, neither character seemed overly flummoxed by any development all that much, and therefore nor was I. Though a futuristic dateline, this is really just a straight up suspense film. All in all, my opinion is that this movie is much like its title: a bit gaseous. While it’s not awful, it’s certainly not more than just ok. I don’t remember seeing any trailers or promos, save what was promoted at SDCC. I found that interesting, but after seeing the film I’m not surprised that it came out in simultaneous release in theaters (limited), on demand and digital. 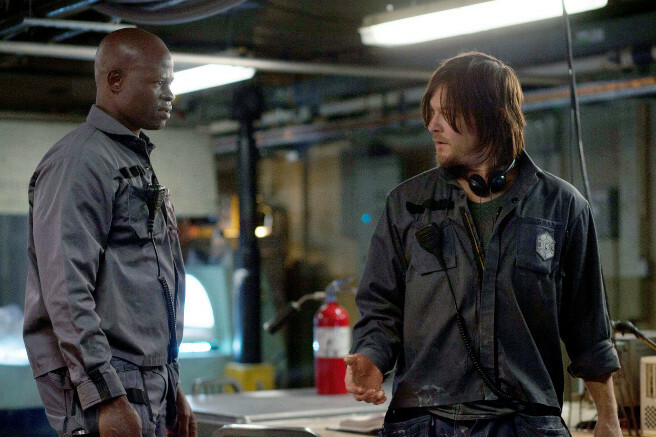 While I was pleased to see Norman Reedus in a role other than Daryl Dixon, that may have been the best thing about this movie. This feels a lot like a fan or even vanity project, though I’m not sure for whom. It’s too bad that Kirkman didn’t engage one of the TWD directors as we know they can drive suspense, but maybe that was a budgetary concern. You may be a curious fan like me, and want to see Air no matter what. If so, don’t rush. I would recommend that you wait for redbox or cable. You won’t have to wait that long. Recommendations: If this type of movie appeals to you, watch Gravity or Alien. Both deliver on that sense of urgency that was missing here. Your Turn: What’s your favorite sci-fi suspense movie, and why?